The internet has changed the way people buy, sell, and rent real estate. These 7 websites are all innovators in the real estate world and in the web 2.0 realm in general. Video podcasting is beginning to become all the rage. Realtors are jumping on this bandwagon and now there are many companies that are beginning to offer "How-to" tutorials and services to show you how to video podcast. Video podcasting can be easy once you learn how to do it. But figuring it out on your own is not. Many of the companies that are offering these how-to services and tutorials are charging outrageous fees to do so. I'm telling you this because I can show you how to do this and I'm open to discussing this with people (Realtors or not) and show them an easy low-cost way to video podcast and get your business out there. Contact me and I will fill you in on the details. I can be reached via e-mail, blog comment, phone, web site, you name it...I'm available. It smells so good. It looks so nice. I love the pretty flowers in front. The spacious kitchen is outstanding. If I love it, my new tenants will also love it. It must be a good investment. Pleeeease! Use your head, not your nose. Just because the home you just walked out of smelled like fresh baked cookies, it probably stunk as an investment. Not that all good looking homes are a bad investment, but the cash flow on these are usually ones that are not worth doing. Recently, I had a client that wanted to purchase a brand new duplex with 2 bedrooms 2 baths and a 2 car garage on each side for $209,900. Depending on what area of the country you live in, this could sound like a bargain or an over-priced elephant. But when you consider that these duplex’s rent for $625 per month on each side, one can quickly see that once you include taxes, insurance, and maintaince, it will take a long time before this animal will pay off; if ever. After careful consideration, the buyer decided that it would be better to look elsewhere. Good choice. Keep looking. Don’t base a home’s good qualities based on if you would live there or not. If you love the wallpaper that does not mean that it will mean anything to your new tenants. Typically, most tenants want a clean home to live in, but color of wallpaper is normally not that important. Cash flow. It is all about cash flow. If the home does not work financially but it smells good, run, run fast. So what really is a good real estate investment and is there such a thing as a bad one? The answer totally depends on who is buying, how much they are spending and what the purpose of the investment happens to be. In the next several installments, we will explore the different types of investments and what makes one good or bad for your specific need. At first glance one would think that of course, there are “bad” real estate investments, however, what may be too risky for one is a gold mine for another. Pete, for example, purchased a plot of vacant land close to a busy highway. It was a nice piece of ground but was noisy because of the nearby highway. It was too far away to be commercial, but too expensive to be residential. Pete bought the property in a 1031 tax deferred exchange with no real plans for the future. Many investors would not look twice at the ground because of the stated reasons but Pete had a situation in which he needed to park his funds from the sale of another property and his deadline was fast approaching. As it turns out, he was smarter than the rest of us since the land next to him was rezoned to commercial, his then could be also rezoned, and now within 2 years the value of his bad investment has doubled. So was Pete just lucky? Not at all. He did his homework and knew that after talking with many city planners that they wanted the land to be converted to either commercial or multi-family, either way would be a winner. As long as the growth in the city continued he was going to be in great shape. But he didn’t take that lightly either or make an assumption about city growth. He studied, looked at employment figures, new businesses coming into the area, he scoured for all the information he could and then realized the potential for the property. As we say in the Ozarks, he did good. Real good. 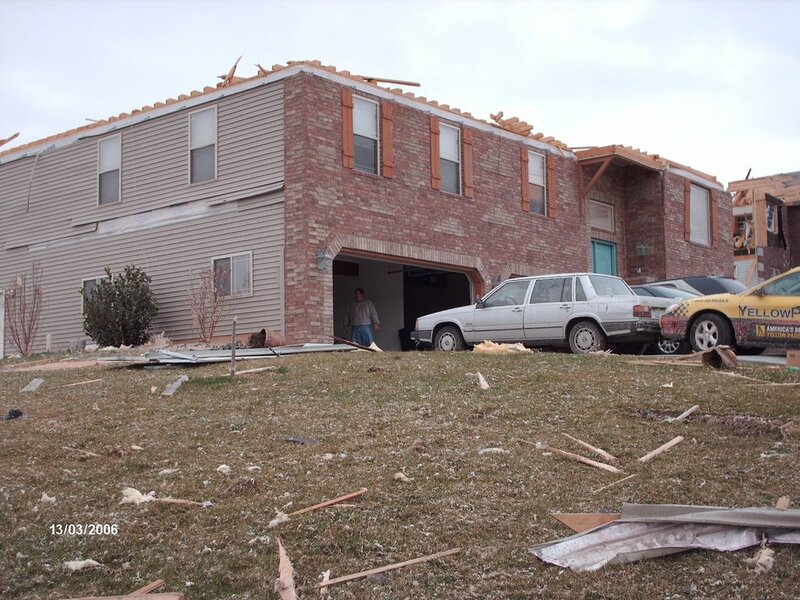 On March 12, 2006, an F3 Tornado ripped through Nixa, Missouri (juts 3 miles south of Springfield). One of my clients homes that I sold them a few years ago got hit hard. 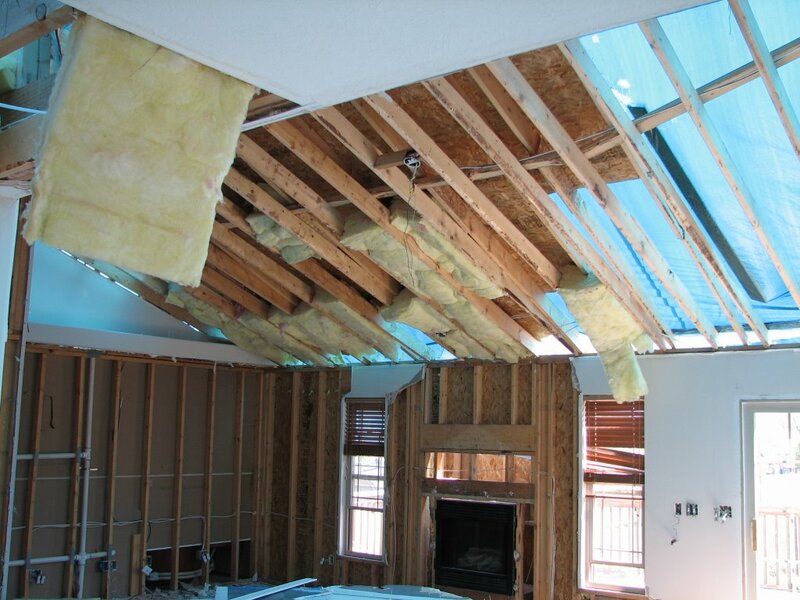 It tore the roof off and did some major damage to their beautiful custom-built home. The good news out of all of this is that everyone is OK and unharmed. It was amazing walking through the damaged home to see all of the debris piles and broken windows, and then see a cell phone charger, fax machine or lamp laying among the debris. Although most of their stuff got moved out already (the big furniture items and clothing, etc.) by the time we had walked through it, it was still very sad to see the wrath of weather hit their home and miss the next. Don't get me wrong, their neighbors were hit too, some more devistating that this one. 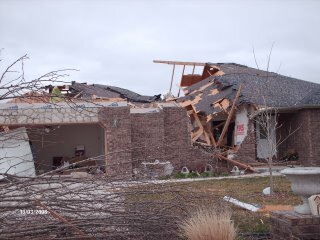 And then some homes in the neighborhood had hardly any damage at all. I had been working on filming on a "Insurance Issues Insured" podcast series, talking about all of the odds and ends of insurance and good reasons to have it. I insure you that it will be interesting. After walking thru the tornado ravaged areas, I figured that this would be a great place to film the introduction. Starting Monday (tomorrow) I am going to be doing a multi-part series about insurance, so don't miss it. Remember to be patient and let it load, it takes a few seconds to load. I want to know about your insurance issues. 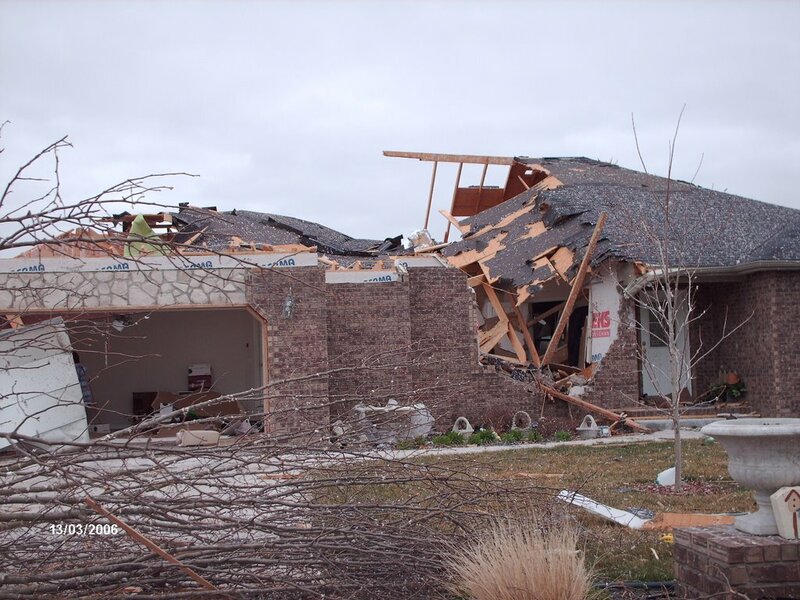 Comment on this blog and tell me about your experiences with insurance, and/or disasters like a tornado, fire or hurricane. Anytime I've got something interesting, of course I want to share it. Therefore, check out this web site (by clicking on the link) that a friend has created. As you know, I have been filming video podcasts on the subject of real estate and property managment and whatever else seems to cross my mind for the day. These podcasts are approximately 5 minutes long and some of them span over a topic series, and some of them are just about the typical day in the life of a Realtor. Now I admit, I can be a quirky guy, so therefore you might want to check these out. People keep telling me that they never know what I'm going to say next. And it's true! First, in case you're wondering what exactly is a podcast?? The good news about podcasts are that they are FREE and you can't pass up something something that is offered for FREE! Check out the definition at Wikipedia (the online encyclopedia) and their definition of podcasting by clicking on the link. RSS Feed: first of all, for you people who are RSS saavy, here is Dizmang Properties RSS feed that you'll need to copy and paste into your newsfeed aggregator: http://www.dizmangassociates.com/podcasts/rss.xml For those of you who have no clue what I am talking about, then keep reading it gets easier, I promise! iTunes: If you already have iTunes installed on your computer, then this will be super easy for you. I suggest iTunes because first of all, it's a free service. Once in iTunes, open the iTunes Music Store and click on "podcasts". Once the podcasts page opens, type "dizmang" into the search field. iTunes will automatically find Paul Dizmang's podcast and all you have to do from here is click "subscribe". Yahoo! : Like iTunes, Yahoo! offers a free and safe software download to search, play & subscribe to podcasts. I also find that it's pretty user friendly and you'll find tons of information. To find and subscribe my video podcast, just type in "Dwellings!" and my podcast should appear for you to subscribe to. This is just to get you started. As you know, I am going to post my video podcasts on each of blog postings that are related to so you can watch them thru this blog too. I am always looking for good topics to discuss in my video podcasts. What would you like to hear about? Comment on this blog with a topic idea and I when I produce a video podcast on the subject, I will mention you by name. I could use your help, so please comment. Interesting Situation. What to do? A was talking to a client today about an investment property and he had asked if he really needed a property inspection since the seller already had one performed. He really didn't want to spend the extra cash to the tune of about $250, and besides he is getting a great deal anyway. The inspection document he had received from the seller looked ok, a few things here and there, but nothing to be overly concerned about. The inspection was done within the last month. The house in question by the way, appears to be serviceable, not bad, not great, and mostly cosmetic items that would need to be corrected. You know, new floor coverings, all new paint, new appliances, countertops, etc. Estimated cost of repairs would be about $10,000 to $15,000. Once the repairs are to be made, the buyer would stand to profit about $10,000 or more. So why go to the expense of spending another $250 for the same result? Easy when you think about it. My investor is about to spend thousands on a sure thing, already has an inspection in hand, and knows what it is going to cost to improve the home. But, since he did not hire the inspector, that individual does not work for my buyer and moreover, the buyer has no idea who he is, what his credentials are, and his level of expertise. I strongly encouraged my client to pay the $250 which he did reluctantly, and come to find out there was at least $3,000 in termite damage that the other inspector failed to mention. Was it an oversight? An error? Actually, upon a careful look at the seller's original first inspection, there is no name or company who did the inspection anywhere to be found. No one to contact, and as far we know the seller did it themselves. Always, always, always have a home inspected by someone that you have paid for and chosen. Yes, it is an expense, but one that could save you thousands of dollars and hours upon hours of headaches. Sometime everything looks ok on the surface, but the sure deal is not always as sure as one hopes. Check out my previous posts and Video Podcasts of the "5 Biggest Mistakes Buyer's Make". It is Easter Sunday and no matter what your religious belief system is, there can be fun for all at the traditional Easter Egg Hunt. Kids line up, the gun goes off and the hunt is on! It is a mad dash to find the best egg, the one with the grand prize hidden inside. As I watch the kids run, many head toward the back of the field as if the "best" egg is always farther away. But what they don't realize is that right in front of them, just 10 feet away is the egg to end all eggs. So a little, cute 3 year old who was just out sized, dwarfed in swarm of other kids, casually walks up and picks up the bright green egg, not having any idea what he just obtained. Isn't that true for all of us? We make the mad dash for the big prize thinking we know where it is, but all the time it is right in front of us. We just have to look down and pick it up. I have seen many people with extraordinary talents who wander around looking for their perfect egg, not utilizing what they have right in front of them. I used to think it would be wonderful to have a traveling sales job; seeing all different parts of the country, staying in swanky hotels, and making lots of money. It is the thought of it that is so appealing until you talk to those who actually do it, and one realizes that they are never home, it is just another motel room, they hate to eat out, and they are very lonely. Realizing how blessed we are not matter what we do is the key. Success is what you make it, not the money you earn or status you have, but finding happiness in everything you do. I am very fortunate to be able to surround myself with fun happy people who love what they do. But it did not happen by chance, looking back we made it that way. Yes, we. All of us. Friends, family, clients and customers. So on this Easter Sunday, relax, enjoy a good egg hunt, and you yourself go find an egg or two. Let your guard down and enjoy the very existence of life. Hug a friend, kiss your spouse, and you will soon realize that the grand prize of all is right in front of you. Everyday it's the same routine. Up at 6, workout to keep the heart healthy, drop off the boy at school, off to the office, pick up the boy, dinner with the family, bedtime for the boy, and whew I'm tired! Each day is about the same. Then I blink. The next day everyone is 10 years older, gray hair starts to set in, my body starts to ache like I have not experienced, and then, I blink again. I have got to quit blinking. You see, as we go about our daily lives we look forward to things that we want to do or will do, but we also need to reflect on what we have done. Was I as productive as I should have been last week? Did I tell my family and friends that mean the most to me that I love them? Was I the father, husband, and friend that I really want to be or was I in too big of hurry to do less important things? Did I really do all I wanted to or could I have done more? I recently had an insurance claim. What a pain. It is good to be covered so that one can recover the loss, but it is a headache. 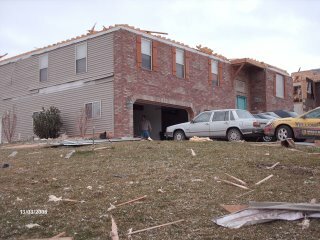 Anyway, the insurance adjuster came out, looked at the damage, and did what he did best. But as I got to know him a little better, I found out that he had not been home but 1 week in 14 months. Lots of storms and damage kept him running all over the county. Now I do appreciate what he does, and he was a very nice guy. But being away from the family for so long one cannot help but wonder if he is missing out on what life is really about. His work is vital and important, but 14 months? Everyday I thank God that I have the ability to be home everyone's, I work with people that are a true pleasure to be with not to mention they are my best friends. On this Easter weekend, I have made a decision to spend more time with my family and friends, give them all big hugs and make sure they know how much they mean to me. I don't want to blink, because the next time I do I fear that I might look back and regret having missed something. So instead, I am determined to live life to the fullest, try new things that I have never done (like this morning doing martial arts for the first time), listen better to my friends, listen again, listen again, and be more sensitive to everyone and everything. I want to view myself as others view me, and make changes, lots and lots of changes to be a better friend. Next time I blink, I want to be proud of every moment from this point to that, know that I have truly tried to enjoy the good times and sad times, and never, never have a bad day. Thank you to my wife, my son, who God has blessed me with. Thank you to my great friend Jessica, who none of this would be possible without her vision, knowledge and commitment. 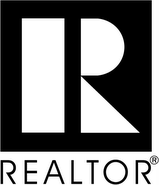 Updating Rental Properties - VIDEO PODCAST! 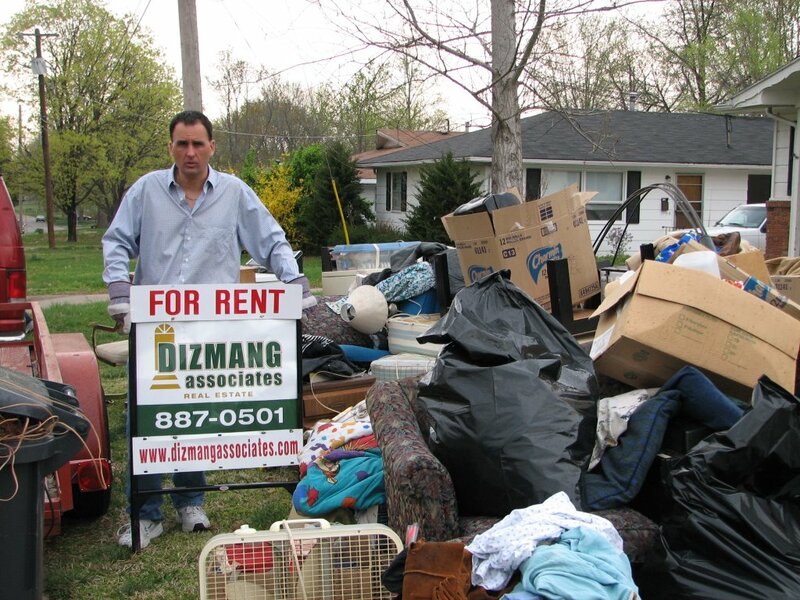 Here, Paul Dizmang, a real estate broker in Springfield, Missouri talks about the good times to update your rental properties. This is a video podcast, so check it out. 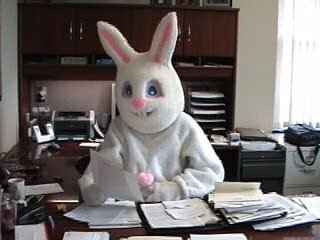 It's the Easter Bunny sitting in for Paul Dizmang! 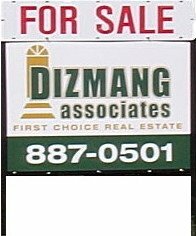 Wishing you a Happy Easter from all of us at Dizmang Properties, Inc.
Great question with a difficult answer. If you have ever stayed up late at night and watched those infomercial, one would be convinced that buying real estate is super easy, the best investment one could ever make, and anyone can just run out of their home buy a property and be rich. If it were really that easy. Buying investment property can be the best thing you ever do or it could be a disaster. The fact is they don't always make money and there is risk. A common misconception is that homes always go up in value, and this is far from the truth. There are many people who lost thousands of dollars when the bubble market in the west went bust, and many were stuck with homes that were worth way less than they paid. Although right now home values in the west are strong, interest rates have risen and prices in some areas are starting to fall. All this to say be careful! One must do lots and lots of homework to make sure that the property one is buying is truly a good value, not just a nice home. There are thousands of nice homes, but few make a very good deal. One must know the full rent history of a property before an offer to purchase is made. You must then decide what expenses will be upcoming (new roof, carpet, etc. ), what taxes and insurance will cost, and of course what will be the principal and interest payment. With this information you are on your way to finding success. Analyze everything. Poor planning equals losses. And losses are no fun. Click on the link below to see the video podcast we have for the "5 Biggest Mistakes that Buyers Make When Buying a Rental Property". Don't miss all 5 installments of this series. 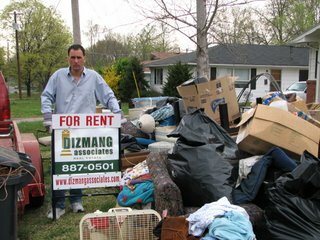 Mistake #5 - "Managing Your Own Rental Property"
Leave us a comment to let us know what you think. Mistake #4 - "Not Knowing How to Develop a Portfolio"
Mistake #3 - "Not Knowing The Property Well Enough"
Click on a link below to see the video podcasts we have for the "5 Biggest Mistakes that Buyers Make When Buying a Rental Property". Don't miss all 5 installments of this series. Mistake #2 - "Approaching the Owner Directly"
Mistake #1 - "Too Little Research"
I love rentals. I hate rentals. Truly a bittersweet arrangement. Rental property investing is truly one of the best things I have ever done. It allows one to take a small amount of money and watch it grow over the years into a nice investment. It is real property. Property that has all five senses. You can see it, feel it, smell it (althought sometimes you don't want to), hear it (as the floors sometimes squeak) and taste the beauty of profit. So why then would anyone "hate rentals?" I really don't; it is the day to day activities that bog most people down. It is about the people, and you learn in time that some are truly wonderful and you would do anything for them, while others have one objective in life, and that is to make your life miserable. I have never said it is easy, actually it is quite difficult to do it yourself and do it well. This is why I strongly advise that one hires a property manager to handle the day to day activities. All of my clients love the fact that we take care of everything while they do what they specialize in and leave the details to us. Although hiring a property manager does have a cost associated with it, the fact that once-you-buy-the-property-you-are-done is what is so appealing to our clients. So, if you decide to invest in rental property, let a pro handle all the details so that you can rest at night in peace while he deals with backed up sewer at 2 a.m. Call me, Paul Dizmang, for more information on how I can help you manage your rental properties. Are your rental properties not in the Springfield, Missouri area? Call me anyway, because I have hundreds of connections across the country and I can refer you to a good property manager in your area. 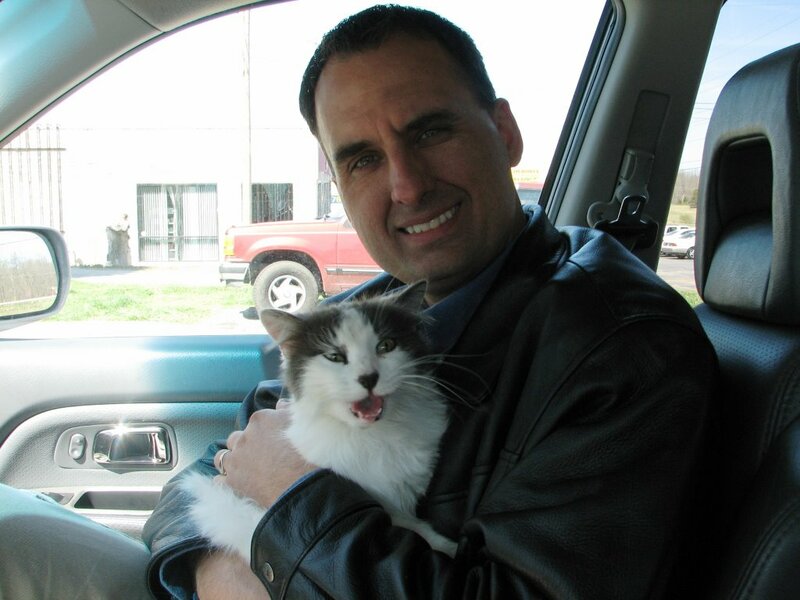 Visit my web site at www.getpaul.com or call me at (417) 887-0501. Thursday was a rough day. A rough day in the sense of we had to physically evict a tenant from a property. Of course it does no good for our investors if we let tenants live in a property for free. So our typical office protocol is to give Tenant's until the 5th day of the month to pay their rent (rent is due on the 1st of each month). Then on the 6th day we send out late rent notices, on the 10th we make phone calls, and on the 12th-15th days of the month we file for a court eviction if the tenant has made no effort to make their rent payment. Our attorney has to file for the court-ordered rent & possession. Once you file, the tenant has approximately 2 weeks to pay their rent or prepare for court. On the actual court date, once we have the judgment we file a Sheriff's execution. The Sheriff then serves the Tenant with a 5-day notice that they must move out. The Tenant has 5 days to move out. In this case, the Tenant's had until Thursday morning at 9am to be out or the Sheriff would physically move them out to the street. Sounds dramatic don't you think? Well it is and the Tenants that we had to evict on Thursday did not take us seriously. I think they were mostly lazy, because when we showed up on Thursday with the Sheriff, we went into the house and physically moved all of their stuff to the curb. By law, we have to let their stuff sit on the curb for 24 hours and then we can have it hauled off to the dump. I admit that this isn't very glamourous, and I'm sure you'd agree. However, this is part of my job in managing rental properties for the investors I represent. This is what these investors pay me to do for them. Contact me, and I'll tell you all the details of what I charge to manage properties. I can be reached toll free at (800) 584-1297. Also, check out our video podcasts. Right now we're discussing the 5 Biggest Mistakes investors make when purchasing rental property without the help of a Realtor. My web site is www.getpaul.com. This is "Newton", an abandoned kitty that we found in one of our rental properties on Newton Street. Unfortunately in property management, tenants move out and leave a bunch of stuff behind for us to clean up. That is exactly the case in this situation, except that the tenants left this cat behind as well and it was one more thing that we, as the property manager, had to take care of. Rental properties can be very lucrative for Investors. Along with managing the properties, I assist Investors everyday in purchasing rental property at a good price so that it will cash flow well for them. If you're interested in knowing more about how this works, please contact me. I can be reached toll free at (800) 584-1297 or e-mail me at paul@dizmangassociates.com or visit my web site at www.getpaul.com. I'd love to tell you how you can make money in investing in real estate. Does anyone know how well this mobile blogging thing really works? This is a test, sent from my Blackberry device, to see if mobile blogging will work for me. Have you seen our video podcasts? Well, now it's even easier because we have been recognized in iTunes! Go to iTunes and type in "dizmang" in the search bar in the podcasts section of the iTunes Music Store. Subscribe to us and find out what Paul Dizmang has to say about real estate, investing in rental properties, etc. etc. Also, be sure to comment here on our blog and let us know what you think. In fact, in your comment that you post, mention a topic you want to hear more about and we'll mention you in our podcast.